I’ve had a couple of fruitful days just now. Even though I’m as sick as one can be, I still had the chance to: i) participate (partially, unfortunately) in a 3-day seminar with Nina Lauder, ii) carry out a week of a teachers training course, and iii) attend a seminar by Herbert Puchta. The downside is that all this, added to my illness, has prevented me from being a bit more active in the online educational community. But I think we all should come to terms with the fact that we can’t do all we want to, huh?! Anyway, this has led me into thinking a bit more about teaching. Many people have been questioning the need for a shift from a test-driven educational system to something that’ll allow 21st-century learners thrive and succeed in a 21st century world. Schools, as we see them these days, have been created to fulfill a certain need, and the question, “Why do we need schools?” had a very simple and straightforward answer. Hence, teachers and students were trained to function within the boundaries and limits of schooling set by those who felt the need to, well, invent schools as they are nowadays. It’s important to make this distinction, as the idea of school has been around for centuries, so I need to make it explicitly that I’m speaking of our current system of mass, standardised educational system. In the past, people were schooled for different reasons, and teachers obviously had to behave differently. Can you picture Socrates picking up a piece of chalk and simply vomiting knowledge on his pupils? What if he tried to teach people to question authority in the early 20th century? Would he still be regarded as a great thinker and educator? What if TEACHING were a word in scrabble? How many points would I get? Supporting – Teachers may still believe that their role is to merely transmit knowledge, but instead they’ve got to support their learners through the voyage of discovery and learning. Engaging – If learners are not engaged, how do you expect them to learn? Teachers have got to put some thinking into how to engage their learners in learning activities. Caring – Most learners seem to build rapport with teachers who care about their learning. I also like to say that teachers should care a lot more about their students’ learning than about their teaching. If there’s no learning, you might as well no bother to show up in class. Sharing – In the age of information, no one will ever have the chance to know everything there is to learn. Sharing is important both for teachers among themselves and also among their learners. Teachers shouldn’t see themselves as the almighty bearers of knowledge. Learning is a lot more fun when it’s done collaboratively. Nurturing – If we come up with a metaphor in which we view learners not as ’empty vessels’, but as people who are capable of thinking and reasoning, it only makes sense that we nurture them – we’ve got to help them develop and make sure we provide them with the right conditions to do so. Assessing – Finally, we’ve also got to assess our learners. We’ve got to give them feedback on their progress, be able to understand what we can do in order to foster growth, and also show them they might not be living up to their full potential. A small part of assessment is testing, and as much as people may criticise it these days, I still believe well-written tests have a place in teaching. I’m sure you can all come up with more ideas for what teaching is. What about sharing them in the comments below? I love all the words you’ve come up with on your Scrabble board! I think one which encompasses many aspects of teaching is “developing”. Too often, students’ achievements are measured in terms of their academic progress, but there’s a great deal to be said for the other skills which they can develop in our classes. Wow! You are amazing even when you are under the weather. I really like your explanation of teaching. I would add that teaching is also learning. We should be in a constant state of learning so that we don’t forget what it means to be a learner but also because none of us is ever finished. Oh, you’re way too kind with your words! I’m really flattered. Loved reading this! It was inspiring and particularly like the scrabble analogy! i stumbled across your blog and I just read what you’ve had to say. I must agree with what you say about just teaching and testing and assessment. I mean face it…we truly need all three of these components in order to evaluate where a student is in order to render a grade. 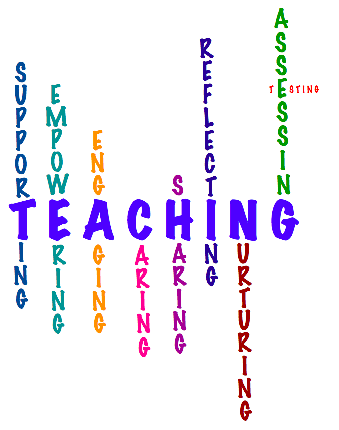 However, all of of these facets (teaching, testing and assessment) are included in our everyday existence as teachers. Coming from the teaching realm in New York, we were very often expected to “teach to the test.” I hated it. I was much more involving, and so were my students, all from Special Ed. These students had different learning styles (auditory, tactile, visual etc) and I loved when they “pushed-back” with relevant questions. Now, teaching in California, all of my students who cannot read, will most often choose auditory learning as their weapon in the classroom. This is empowering to them in my class, but they cannot write and this deficiency will inevitably be their kryptonite of the world. It’s a shame to see many of my students both in New York and here, in California, “slip through the cracks.” Disabilities that should have been addressed, and perhaps worked on in a better fashion were ignored in their primary learning years, and as a result, these students were just passed along until they got older and in-turn, they are now frustrated that they cannot read or write, and as a result much of their academics are clouded by defiant behavior. So essentially, they “act-out” because they can’t learn. Where is the justification? How will they be able to justify the fact that they cannot read or write and they are now 18 years old? We as educators, or I as an educator can only do so much with them while they are in my classroom…who will do the rest? Teaching is a lifelong learning experience and having a good teacher is a blessing. ← Is there such a thing as THE method to learn a second or foreign language?